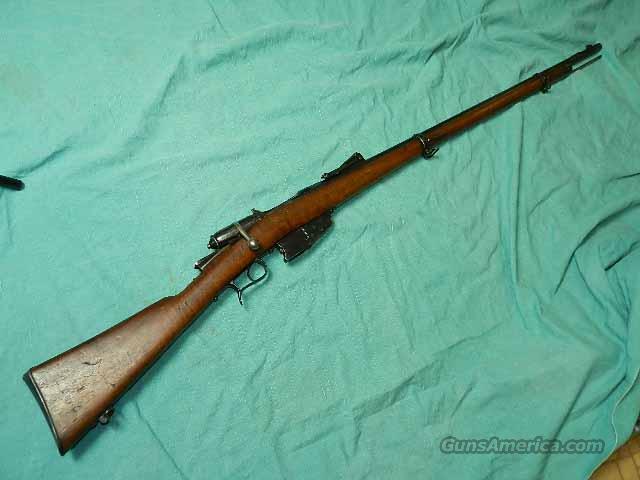 Description: ITALIAN VETTERLI TORINO converted to center fire, cal. 6.5MM This ITALIAN military gun has very clean European walnut wood, complete with proofs, looks good and clean finish . Medal is mostly blue, looks refinished . My guns are estate found, and often need cleaning from a long storage! Action works good, and the 33" barrel has a bore with strong rifling and in the grooves roughness from using wartime corrosive primers Rear sight is graduated to 2000M. Medal parts are clean and maker is the rarer:TORINO.Has the metal cleaning rod.Action is tight, and would make a good shooter. Stock not numbered to the gun. We don’t have a web site, and sell on the internet only. .I hope you like my wide selection of unusual guns, knives and gun parts. I try to keep the prices affordable, which means I make less money than most dealers. I consistently have the best selection of older guns If you BUY IT NOW you must still contact us for details buy it now doesn't end the sale, it just sends an email telling us you want to buy this gun. A phone call won’t secure a sale! Not home many times, the first buyer by email buys the gun! Best to send another email . Sometimes not home to get calls. Some guns are required shipment to a gun dealer near you for a transfer to you when it arrives. With the widest selection of older guns at great prices, check my inventory for new listings!